SAVE THE DATE! 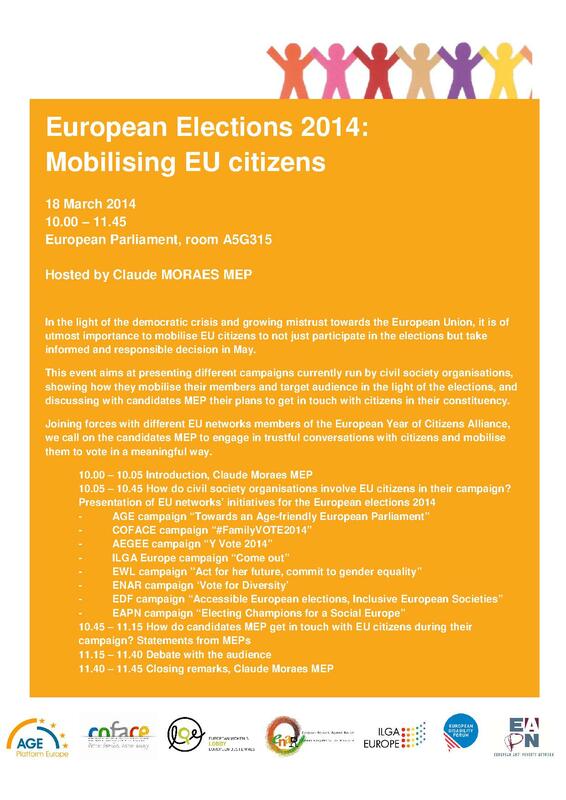 European Elections 2014: Mobilising EU citizens – "The Europe we want is for all ages"
With the support of AGE Platform Europe, COFACE, ILGA Europe, EWL, ENAR, EDF and EAPN, Claude Moraes MEP will host on the 18th of March an event on “European Elections 2014: Mobilising EU citizens”. European Parliament elections are the periodical momentum to test both politicians’ and citizens’ engagement and capacity to debate on how best shape our societies and improve European integration for the benefit of all. In the light of the democratic crisis and growing mistrust towards the European Union, it is of utmost importance to mobilise EU citizens to not just participate in the elections but take informed and responsible decision in May. Civil society organisations have a crucial role to play to both voice citizens’ needs in policy developments and to fight against populism and misrepresentations about the EU. However, this can only work if candidates MEP run honest campaigns and take the time to inform the general public about EU competences and what the European Parliament effectively does. This event aims at presenting different campaigns currently run by civil society organisations, showing how they mobilise their members and target audience in the light of the elections, and discussing with candidates MEP their plans to get in touch with citizens in their constituency. This would offer the opportunity to discuss concrete actions candidate MEPs could undertake before the poll and to debate on how to promote during the next term participation of citizens in the elaboration, implementation and monitoring of policies at all levels i.e. based on the principle of civil dialogue. Joining forces with different EU networks members of the European Year of Citizens Alliance, we call on the candidates MEP to engage in trustful conversations with citizens and mobilise them to vote in a meaningful way. The event will take place on 18 March at the European Parliament, room A5G315, from 10.00 to 11.45. To register, please contact Ophélie Durand at ophelie.durand@age-platform.eu. and visit our websites: AGE, COFACE, ILGA Europe, EWL, ENAR, EDF and EAPN.